Sue Dawe CA talks about her new role at EY and how she has seen attitudes toward women in senior positions change over her career. How confident are FS leaders in their digital ability and what technologies are they investing in? 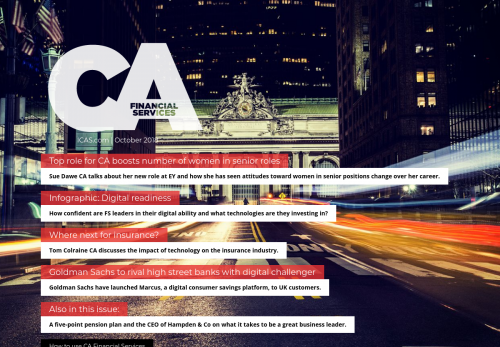 Tom Colraine CA discusses the impact of technology on the insurance industry. Goldman Sachs have launched Marcus, a digital consumer savings platform, to UK customers. A five-point pension plan and the CEO of Hampden & Co on what it takes to be a great business leader.